There’s a reason the sun shines on New Zealand before anywhere else – every new day in Aotearoa is something to cherish! Small, remote and thinly populated, yes, but NZ punches well above its weight with its outlandish scenery, fabulous festivals, superb food and wine, and magical outdoor experiences. Equally impressive is NZ’s potent, mainstream Maori culture. This is a country that recognises and celebrates its indigenous people – the world is a kinder, gentler, more respectful place down here! And while the fanfare surrounding the Lord of the Rings trilogy is waning, visiting the real-life Middle-earth still has a geeky allure – LOTR director Peter Jackson’s filmmaking prowess still holds Wellington (aka ‘Wellywood’) in its thrall. Nature-lovers feel drawn to this country. Spot New Zealand’s unusual and protected flightless bird, the kiwi. Visitors and locals alike love to dolphin watch in the far North, while the beautiful Kaikoura Coast on the South Island is renowned for the pods of giant sperm whales, humpbacks, and even orcas.New Zealand’s thick, green forests and rugged coastlines are home to an array of endemic wildlife, most of which cannot be found anywhere else on earth. To ensure the preservation of New Zealand’s native species, there is a growing number of conservation initiatives aimed at ensuring a future for the country’s unique wildlife. A visit to New Zealand presents ample opportunities to meet some of the country’s most unique and endangered animals – whether it is on a predator-free island sanctuary, a national park, or a natural enclosure in the heart of the city. Get your heart thumping with one of many adventure sports on water, land or in the air. In Queenstown, take a jet boat for a spin, or give quad (4-wheel) biking a try. Like New Zealand’s bungy-jump innovation, there’s always an adventure awaiting! No other place offers more golf course land per person than New Zealand, a nation of golf-lovers with over 400 golf courses. Tasting a traditional Maori Hangi food from an earthen oven heated with red hot stones is a must. Dine on fresh scallops, whitebait and crayfish, or perennial favorite, New Zealand lamb. A perfect complement to any fine meal is one of New Zealand’s award-winning Pinot Noirs, Chardonnays, Sauvignon Blancs or Rieslings, enjoy! An easy way to get around New Zealand is to take a fully escorted vacation with an expert guide, or a mini tour including highlights of the North and South islands. All of our tours offer accommodation choices to suit your budget. Some tours include a self-drive option, providing the freedom to drive yourself. Where unspoiled wilderness and modern, sophisticated cities meet Where unspoiled wilderness and modern, sophisticated cities meet See map of New Zealand on inside back cove. 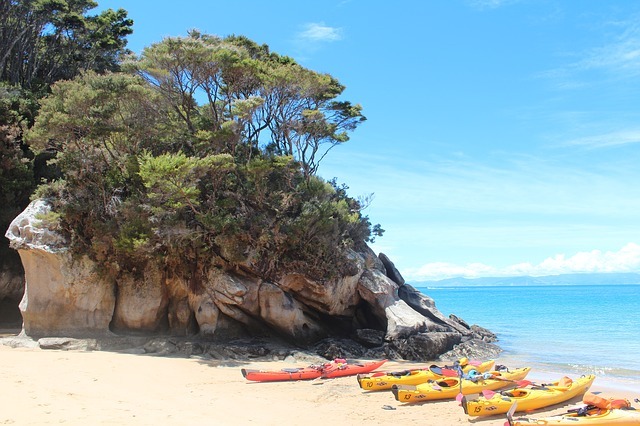 From the cosmopolitan hub of Auckland to the expanse of 90-Mile Beach, Northland and Bay of Islands offer a mix of sailing, fishing, islands and beaches. Discover active volcanos, thermal mineral pools and underground Glowworm Grottos in this extraordinarily diverse area. See a Maori performance where myths of New Zealandâ€™s heritage are relayed through hypnotic song and dance. For quiet pleasure-seekers, luxury lodges around Rotorua and Taupo welcome you with warm hospitality. This region is renowned for its creativity, countryside and extreme coastline. An hour northeast of Wellington is the famous wine region of Martinborough. Wellington, New Zealand’s capital, boasts some of the country’s finest galleries and museums, including Te Papa National Museum. After a 2 1/2 hour cruise through the Marlborough Sounds, you will arrive at Marlborough, another celebrated wine region. Nelson is home to the unique World of Wearable Arts. New Zealand is a land of extremes and nowhere is this more obvious than in the middle of the South Island. On one coast is the “garden city” of Christchurch. Ride a punt on the Avon River, glide over the Canterbury Plains in a hot air balloon, or visit the stunning Botanic Gardens. Head north to Kaikoura to see giant sperm whales, dusky dolphins, fur seals and other wildlife. The West Coast’s World Heritage area offers some of nature’s true miracles: glaciers, rainforests, blowholes and Pancake Rocks. 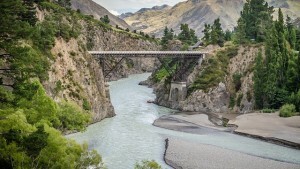 For a trip you will never forget, take the TranzAlpine train across the Southern Alps – considered one of the world’s top train journeys. Around Queenstown, Lakes Wakatipu and Te Anau are picturesque places to kayak, jetboat and sail. Enjoy the adventure scene in Queenstown and try a jetboat ride, bungy jumping, or scenic flight. At Milford Sound, prepare yourself for breathtaking scenery. NZ sits smack-bang in the Roaring Forties, which means it gets ‘freshened’ (some say blasted) by cool, damp winds blowing in from the Tasman Sea and is consistently slapped by the winds howling through Cook Strait. On the North Island, the western sides of the high volcanoes attract a lot more rain than eastern slopes, but the rain shadow isn’t as pronounced as in the south – the barrier here isn’t as formidable as the Alps. North Island rainfall averages around 1300mm annually. The warmer high-season months (November to April) are ripe for outdoor exploration. Summer (December to February) is also when Kiwis crank up the food and wine festivals, concerts and sports events. December in the far north can be rainy, however. If you’re a snow bunny, visit when the powder is thickest – June to August is skiing high season. Remember, though, that in winter, warm-weather beach towns might be half asleep. If you want a real holiday, staying and eating in your venues of choice, avoid school holidays (particularly mid-December to early February) and public holidays. Most places are packed to the gills with campervans, tourists, highly strung parents and inexhaustible children in the post-Christmas weeks. The cooler, less touristed ‘shoulder’ periods (October/November and April/May) are a much better idea. NZ is smack-bang in the middle of the Roaring Forties – prevailing west-to-east winds buffet the country year-round, ranging from gentle breezes to tempestuous gales. On both islands it’s drier in the east than in the west, where mountain ranges snare moisture-laden winds from the Tasman Sea. It’s usually a few degrees cooler on the South Island than the North Island. Wherever you are, remember that NZ has a maritime climate – the weather changes rapidly. Anyone tramping at any time of year needs to be well prepared for all weather conditions. The NZ Mountain Safety Council has the information you need – available from DOC visitor centres nationwide. New Zealand’s unit of currency is the New Zealand dollar (NZ$). Coins have values of 10, 20 and 50 cents and $1 and $2. Notes have values of $5, $10, $20, $50 and $100.